Cyber Intelligence Europe 2015 will analyse the different types of cybercrimes being faced to government agencies across Europe. Many public and private sector organisations are being targeted with the criminals exposing sensitive information to the public. 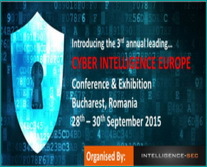 Cyber Intelligence Europe 2015 (organised by Intelligence-Sec) will bring together leading cyber security officials from Europe’s leading government agencies, military and law enforcement agencies who will provide in-depth and knowledgeable presentations discussing current strategies being used by them to protect their computer systems as well as sharing information through the use of case study presentations. Conference agenda.